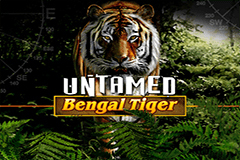 Microgaming have a series of ‘Untamed’ pokies and Bengal Tiger shares an overall style and gameplay with Crowned Eagle, Giant Panda and Wolf Pack versions, but they all look great and have some nice features attached to them. Nature lovers will appreciate the pictures of cute animals across the reels, while everyone will like the extra wilds, free spins, lucky nudges and a gamble round that add variety to the run of play and hopefully cash to bankrolls of anyone spinning the colourful reels. All of these games are beautifully designed, with an expertly rendered jungle background image offsetting the reels nicely. It’s subtly animated, with the trees swaying gently in the breeze and the reels surrounded by a silvery pattern that doesn’t really fit in with the theme but looks good anyway. Underneath each reel there are 4 little black boxes and the mystery of what they are doing there and their purpose in life will be answered in a bit. This is a 243 Ways to Win pokie, which is a popular format for Microgaming and sees players winning whenever 3 or more matching symbols land on adjacent reels running from the one on the left side. It also means that because all positions are permanently active there’s no option to play just a line or two and the bet range starts at 0.30 per spin. Coin values can be adjusted from 0.01 to 0.10 and the number of coins raised from 1 to 15 for an overall maximum wager per spin of 45.00. The paytable lists how many coins will be paid for each winning combination and at the lower end we see the classic 10, J, Q, K and A symbols while at the upper end, there’s a few nice pictures including the jungle, some deer, baby tiger cubs and the majestic looking tiger itself. Anytime a winning spin occurs, players can opt to gamble some or all of it in the Your Gamble feature. Half the win can be banked, or by adjusting where a needle sits on a round dial, the risk and potential rewards of the gamble can be determined by the player. Clicking a button spins the needle and the process can be repeated until the gamble limit is reached or a losing spin happens and it’s all lost. There are plenty of other bonus features however, with those little black boxes under each reel revealing themselves to be part of a Collect A Wild feature. The Untamed Bengal Tiger logo is wild, replacing other main symbols if it can complete a winning line by doing so, also paying out some big wins when making up a line on its own. Each time a wild appears, it will also activate a wild icon in the mysterious boxes below that reel, and whenever all 4 are filled up the whole reel will turn wild, while the others will spin 4 times. If more than 1 reel gets all the boxes ticked at the same time players get each relevant one wild for some even bigger potential wins. The tigers’ eye is a scatter symbol, so it doesn’t need to be in any particular positions to reward players, while the amount paid out will be a multiple of the total bet per spin rather than just the line bet. There’s 5x, 15x or 100x the stake awarded for 3, 4 or 5 scatters, and they will also trigger an interesting free spins round. Why interesting? A generous 20 spins will commence, during which any wild symbols that appear will move down 1 space with each subsequent spin which can make these spins more rewarding than the base game. It’s also possible to have a scatter symbol peeking out from above or below the reels, which can cause the reel to nudge up or down a notch to trigger the free spins. Does it Earn its Stripes? This is without doubt a good-looking game, with some exceptionally well presented symbols and that impressive background to proceedings. Some may be a bit disappointed to see the playing card symbols on yet another game, but that’s a benefit to others and anyway is really not important when the bonus features kick in. Things like free spins with extra potential payouts, wild substitutions and that exciting gamble feature make this a welcome addition to the Untamed range from Microgaming.